Variety is the spice of life. If you don't have time to cut up fruits and vegetables for your pond fish, give them this "fruits and greens" blend. We've done the cutting and blending for you. There are apples, apricots, kiwis, mangos, papayas, peaches, pears, broccoli, cabbage, peas, red peppers, tomatoes, zucchini and spinach in this scientific blend. Microbe-Lift Legacy Fruits & Greens Koi & Goldfish Food - 2 lbs. 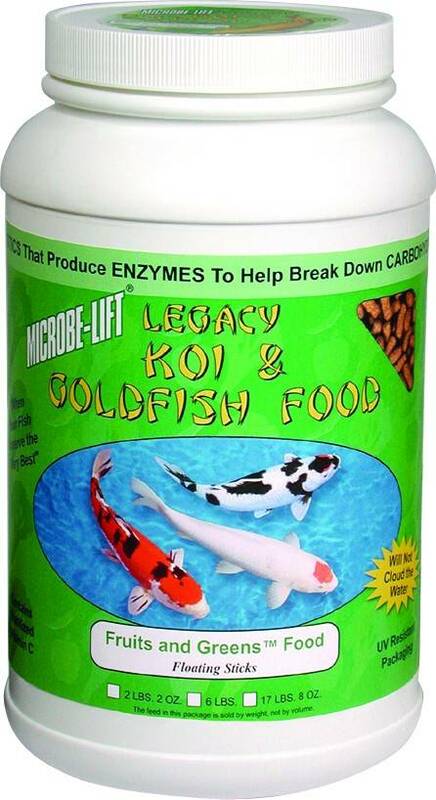 Microbe-Lift Legacy Fruits & Greens Koi & Goldfish Food - 40 lbs. Microbe-Lift Legacy Fruits & Greens Koi & Goldfish Food - 4 lbs. 8 oz.